A lot of people feel uncomfortable talking about periods and avoid the topic at all costs. Periods are normal and almost all women have one every month. It’s a normal part of life, so why should we feel embarrassed to talk about it? If your anything like me, then periods aren’t exactly something you look forward to. A lot of people dread that time of month as periods can be uncomfortable for some. Pink parcel kindly sent me one of their period care parcels a few days ago to try out and review. 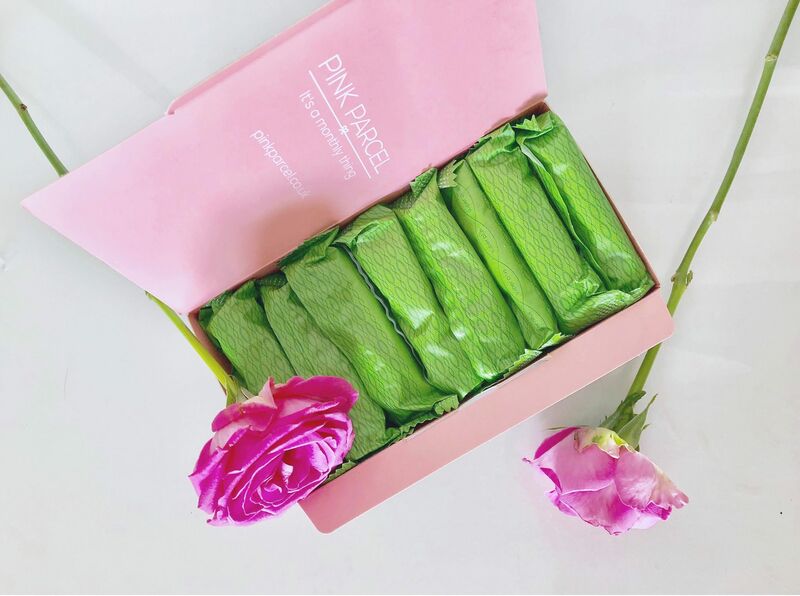 If you haven’t already heard of them, pink parcel is a monthly subscription box that gets delivered to your door every month. You can choose when you want it to be delivered, which sanitary products you would like to receive, for example, if your a tampon kind of girl, you can select tampons. You can also select mixed. They send out period essentials and some lovely products to make you feel better. Their aim is to make women feel good even at that time of the month. The subscription box is £12.99 per month and you can unsubscribe at any time. I absolutely love the idea of it, its genius! So what’s in the Pink Parcel period subscription box? 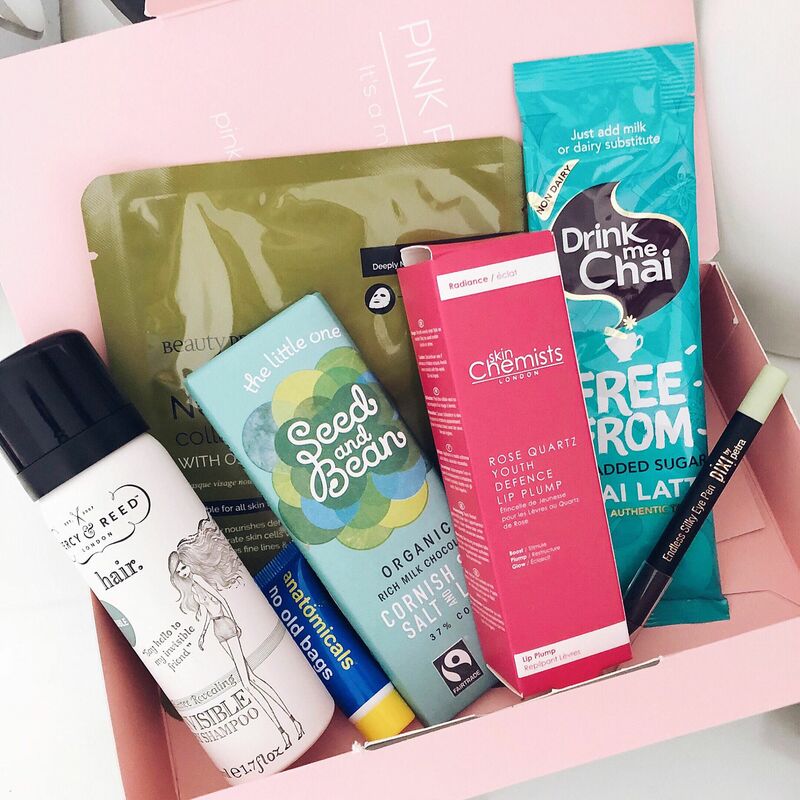 It’s a box filled with over £40 worth of beauty, skincare and lifestyle must haves. 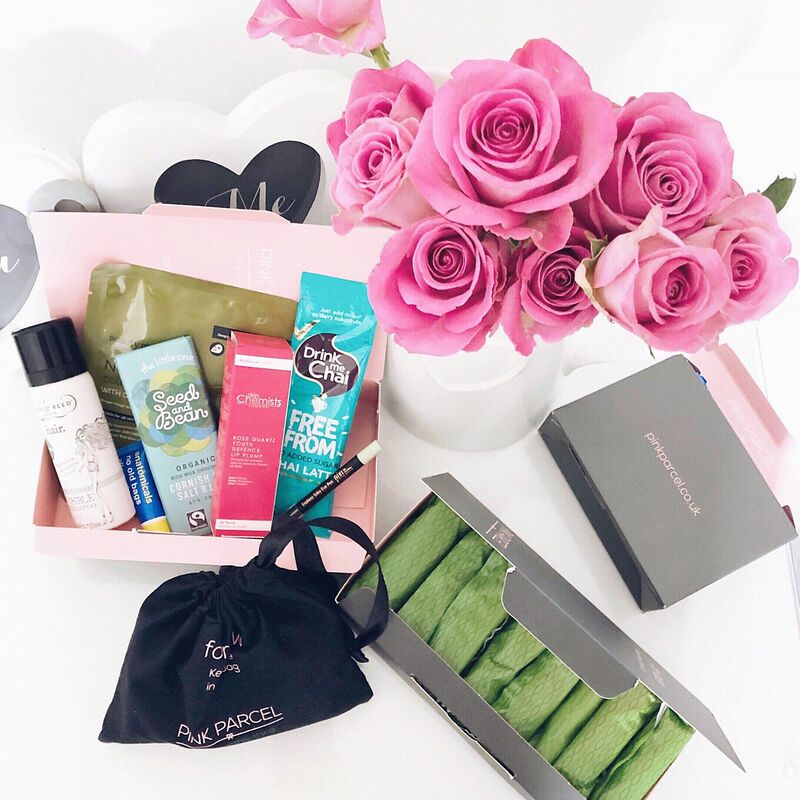 You’ll receive little boxes with beauty, skincare and lifestyle essential products in one big box. I was really happy to receive this as its such an essential if your on the go or don’t have time to wash your hair that day. Percy & Reed claim that the dry shampoo gives your hair a beautiful ‘just-washed’ look even if you haven’t the time to wash it. It’s ideal for all hair types between washes as a quick-fix makeover for dull, lifeless, lacklustre hair. It smells really nice and fresh and it doesn’t go powdery like a lot of other dry shampoos do. For best results, spray onto a brush and work through the hair from roots to ends. I was so exited when I saw this! The rose quartz lip plump can give you fuller lips without the pain of fillers. The lip plump is designed to hydrate your lips whilst boosting them for a fuller pout leaving them soft with a glossy finish. If you want fuller looking lips but don’t want to commit to lip fillers then I think you will love this product. I struggle with under eye bags. My under eyes look so dull at the moment. I’ve found myself wiping under my eyes with makeup remover thinking that I had mascara or something under them only to realise that its my dull under eye bags! Ugh. I was so happy to see this as I’ve been needing something like this for a while. Lets hope it works! Can you believe that I’ve never tried a Pixi product before? I keep seeing how beautiful their products are but I’ve never gotten round to trying any of their products so I was so happy to see this! I just love all of Pixi’s packaging, its so cute and its so photogenic which is always a plus. I love face masks, if your having a bit of a rubbish day and fancy a pamper night then a face mask is a must. I used this face mask more or less straight away. Its such a lovely face mask and leaves your skin feeling refreshed, hydrated and soft. Everyone loves a bit of chocolate! I’m not going to lie, I ate this more or less as soon as I received the pink parcel… Oops! It tasted amazing. It was so creamy and tasted like a luxury chocolate. If your looking for a little pick me up whilst your on your period, then this chocolate may do the trick. I’m a huge lover of hot drinks! Lattes, coffee, tea, hot chocolate.. you name it, I’ll drink it. I’m a firm believer that a cup of tea can solve just about anything. Before drinking this chai latte, I’d never actually tried one. I was a bit unsure on how it would taste but it tasted absolutely amazing! If you like lattes, then definitely try a chai latte. If like me, you crave chocolate, all things sweet, and hot drinks galore at that time of the month then you’ll love the products inside of pink parcel. Inside the other boxes were various period essentials. I received a box full of tampons and some sanitary towels for the night time. I was pleased that there was a large box of tampons as tampons are my go to. I’m definitely a tampon kind of girl rather than pads as thats just my preference, but everyones is different. The fact that there’s a mix of both in this box is brilliant as you can alternate between both. It’s a lot safer to go to sleep using a pad as it reduces the risk of toxic shock syndrome if you use tampons during the day. Theres also an option to donate your unused pads and tampons to charities which supply sanitary products to women who can’t afford them. Theres a pre paid slip which you can fill in to send them. This is a brilliant idea because everyone deserves to be able to use tampons and pads when they’re on their period. Pink parcel is such a brilliant idea. I can’t recommend it enough. I am so happy with my box and very grateful I had the opportunity to try pink parcel. 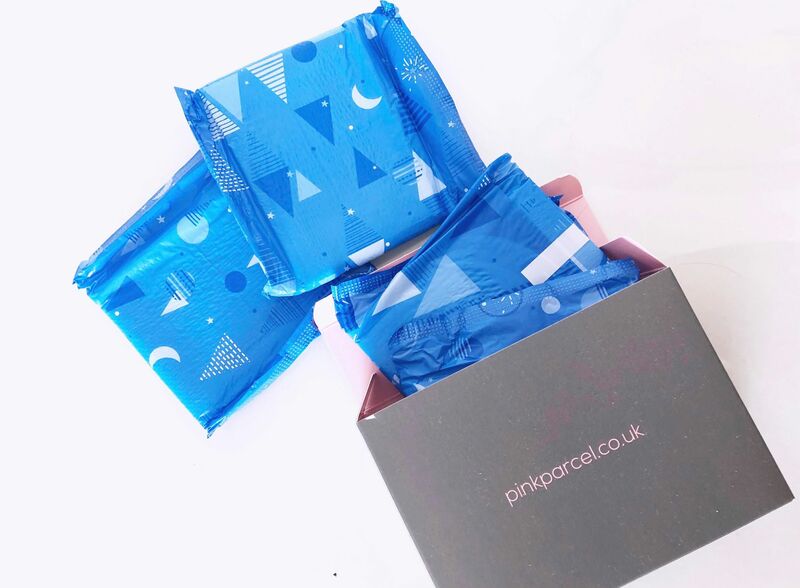 I love the fact that with pink parcel, periods don’t always have to be gloomy and you can actually look forward to that time of the month with pink parcel! Pink parcel will definitely cheer you up, as it did with me. It’s such good value for money and contains really good high quality products. I will definitely be subscribing to pink parcel from now on. I can’t wait to see next months parcel. Oh brilliant! This is such a good idea of feeling more at ease around your period! Just what a girl needs!